Dear Dr. Narda, I’m a retired pharmacist and a collector of old medicine bottles. Some of the things I find have the darnedest ingredients, from creosote and pennyroyal to henbane and mercury (Calomel). Recently, I was chatting with a veterinarian who’s a neighbor of mine that has gotten into learning to prescribe Chinese herbs. Of course, as a pharmacist, I’m accustomed to a certain level of science showing safety and effectiveness of the products we sell. Having seen how far pharmaceuticals have come, it’s hard for me to believe what passes as “medicines” for animals these days. Have you looked on the labels for bottles of this stuff? On one, I saw the ingredient “Strychnos” which I know of as the herbal source of strychnine. Tell me it isn’t so! Have we gone backward in time? How can this be safe or prudent? There wasn’t even a listing anywhere on the bottle or the manufacturer’s website about how much strychnos was in there! What’s happening here? Flummoxed. Dear Flummoxed, Ah, yes. Strychnos nux-vomica.The herbal source of strychnine. Still considered a poison, but appearing in veterinary Chinese herbs in undisclosed (“secret”) amounts. The Chinese name for strychnos is Ma Qian Zi, so you may have seen that on the label as well. It sounds as though your neighbor is in a Traditional Chinese Veterinary Medical (TCVM) course where they emphasize metaphorical, rather than pharmacologic, effects of plants. That way, especially for herbal strychnine, the outcomes don’t sound nearly as dangerous, or deadly. For example, the TCVM “action” for strychnos is that it “moves Qi” and “relieves pain”. Imagine if all you were taught in pharmacy school was that drugs moved around invisible energies. That is obviously unwise and insufficient. Believe me, I’ve tried to awaken my colleagues to the issues of prescribing herbs with a “black box” attitude concerning their mechanisms of action, as though what they don’t know won’t bother them or hurt their patients look at this site. Boy, are they mistaken. Why TCVM practitioners recommend it is beyond me. I’m flummoxed, too. 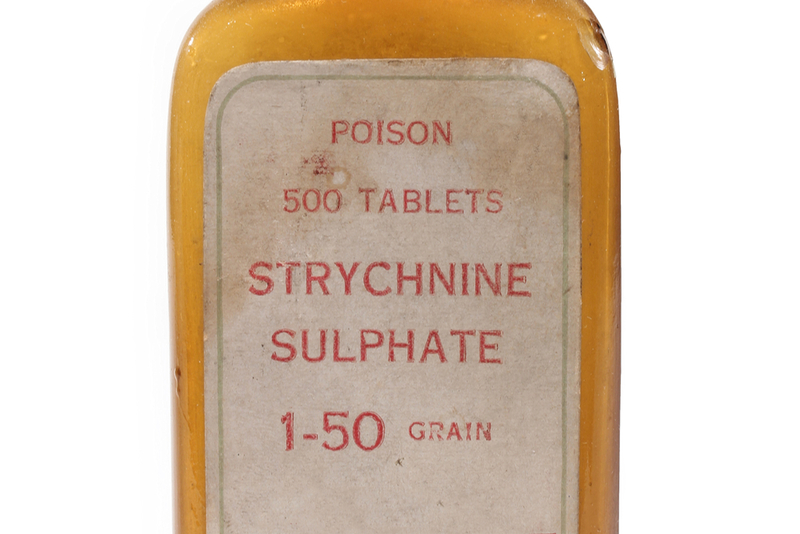 If you’d like more information on the topic, this is one of my monthly columns in Veterinary Practice News that I wrote about TCVM and strychnine: “Selling Strychnine“.